The past three mornings, I’ve flown into my garden after checking the news in the aftermath of Trump’s worrisome press conference with Putin. Sharp pruners in hand, I tackled the wild, over-grown forsythia shrub at the driveway entrance. Branches, thin and flexible, stretching to the sun, had bent and curled between and betwixt one another in pursuit of the sun. The first day, I followed each branch to its rooted undergrowth. Bending and reaching, I cut each one at its source. After an hour and a half, my back signaling “enough,” I turned to the lilies, always in need of tidying. Uplifted by the sight of yellow, vivid red, crème, and fuscia flowering, I plucked yesterday’s wet and drooping blossoms, filling half a bucket. Creating order is good for one’s mental outlook. On day two, I began to shape the shrub. I targeted meandering, spiking branches and snipped at the nods between two leaves to encourage a soft, wavy pattern. As I moved up and down, over and around, I shaped and re-shaped the dancing tendrils. The focus on the task at hand, somewhat challenging, lifted my spirit. On the third day, I was contented with the tamed, undulating shape and tended to the few dry, dead clusters at the base. At the last, I stepped back and scanned each side. Pruning is art. My vision complete, I sighed in gratitude. When the world is wild with anxiety and worry, when I cannot stop checking the news, the garden calls. It is enough to set a goal, even a mindful walk and to proceed. The esthetics of the space— the variety of species, the coloration of purple and red astilbe, white, rose and yellow zahara zinnias, the dogwood, and the mooga pine and peach azalea shrubs—offer variety and delight. Our minds and bodies entrain (tune with) the shift in pace and rhythm. Now that the frogs have returned, their heads peer out above the water’s edge along the rocks of the little pond. I missed them terribly in late spring; for over the years, I had come to rely on their presence as the garden awakened. But nature can be unpredictable. Last year, across the driveway from the forsythia, an Asclepius (butterfly weed) carried by a bird, no doubt, appeared. I wanted to pluck it from the bed of lilies and zinnias but Crystal, my gardening helper, cautioned me. It could attract butterflies. Late yesterday, in my car, stopped for traffic at the driveway’s entry, I glanced to my left and there, perched on the edge of the Asciepius, was a monarch butterfly. It hovered, flew and set down again. I grabbed my iPhone and stepped out of the car. In seconds, a shimmering green hummingbird darted below the butterfly and in a flash, sped away. The butterfly lingered on, flitting to and fro, setting down once more as if she knew how much I wanted to capture her spread winged. I’m grateful to share my picture; I’m grateful to Mother Nature for nurture. This entry was posted in Creativity, Currents, Happiness, Mindfulness, Nature, Politics, Relationship(s), Sustainability, Uncategorized, Well-Being and tagged butterfly weed, entrainment, mental outlook, monarch butterfly on July 23, 2018 by fayewriter. What a wonderful way to take care of both ones physical and mental health and share the beauty with those passing by. Thank you, Sheila! I was pleased to share the beauty of my special spot last night. 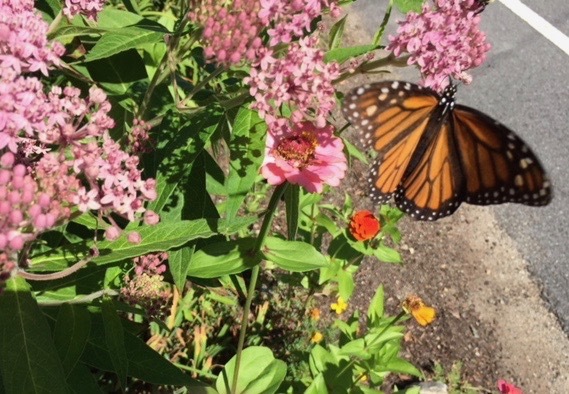 I appreciate how the essay paints two approaches to managing in difficult times: you can trim, prune and work heartily to clear things out–or simply wait, hold off plucking the butterfly weed, and watch as an actual butterfly alights. Rosemary, yes, the choice of action or patience and to know when, what and how. As ever, thank you!